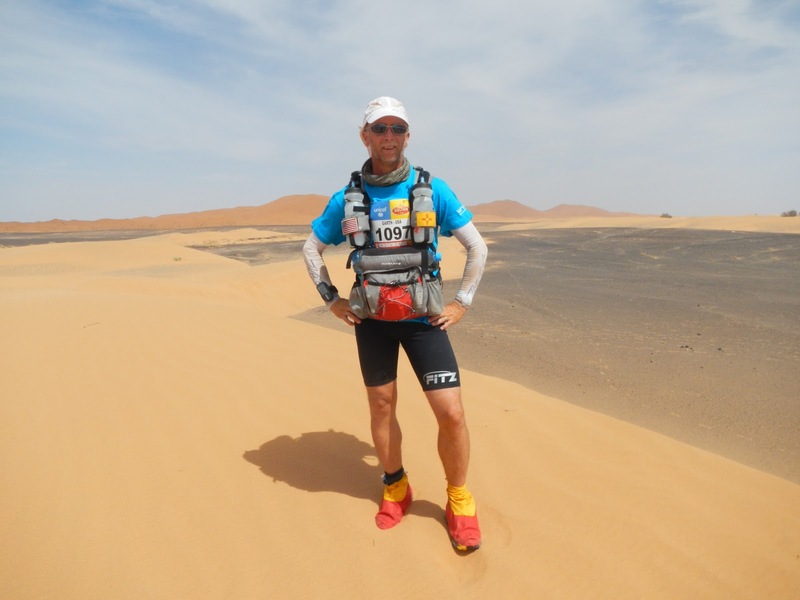 Here is a re-post of my 2013 MDS After Action Review…….. This is the first review of my participation in the 2013 MDS. I am specifically covering what did not go so well during the event. Fortunately these were only minor in nature and I was able to carry on quite well. I will also post soon the numerous thing that did go well for me. Both contain lessons learned and should be of interest to the community in general. 1. Not quite enough TP – The lack of enough “desert dollars” could have been a disaster. Fortunately it was only an inconvenience since spare was available from those abandoning in my tent. In the future I would bring almost an entire roll. 2. Not enough protein in diet – The lack of sufficient protein for me especially during breakfast was a hindrance. I wound up getting hungry and approaching a bonked state earlier during the day than I had anticipated. Slim Jims saved me in this regard and I began to eat my ration of these along with my breakfast to get me through the stages. 3. Broken critical equipment- Specifically sunglasses. Mine failed upon arrival at the bivouac. Fortunately, I had brought a spare pair with me and had access to them. 4. On-the-move food selection less than optimal – Bars while high in calories were difficult to consume. Hammer cranberry bars were ok. Almonds were not as palatable while exerting but OK to snack on in camp. I would include some dried fruit (apricots) in the future. 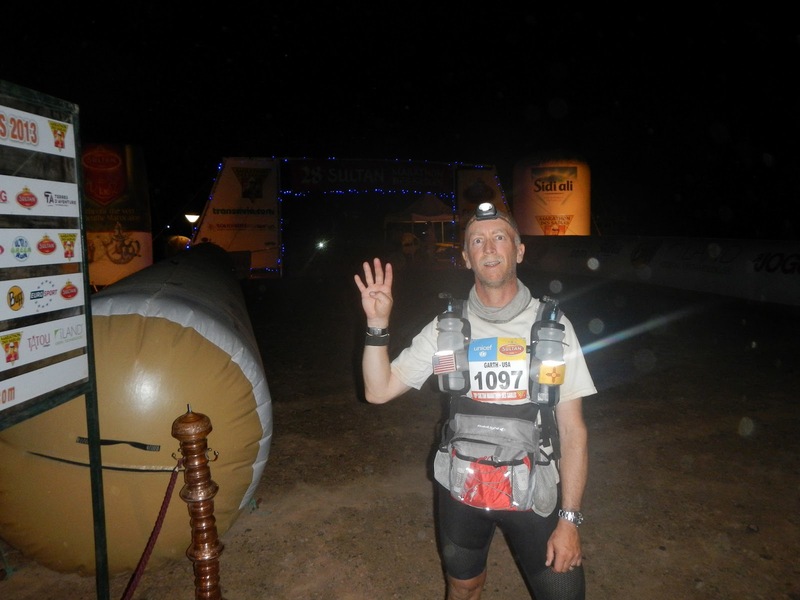 End of Stage 4 – I am SO Hungry! 5. Lower back taping – While I never had issues with pack rubbing during training, the day after day insults along with the heat give me a case of road rash on my lower back. I would advise taping this area as a preventative measure in the future. Some also taped their shoulder regions. 6. Improper shoe tension – Or should I say I didn’t tie my shoes properly on Stage 2 and got some toe blisters. I was overly concerned about shoes being too tight and lost sight of going to the other extreme. 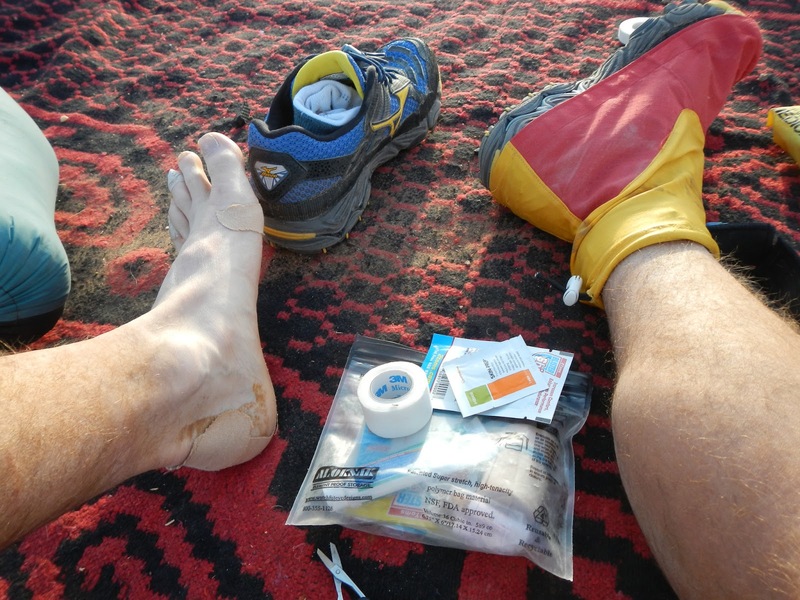 Foot Maintenance – Twice a day minimum! Now for the second review….what went well. Many things worked out well for this event. I attribute this to detailed planning, testing and defining my requirements up front. With the exception of my sand goggles I used everything in my kit. I had nothing extra (except meds) and had no real material needs beyond what I carried. Below are some highlights and explanations. 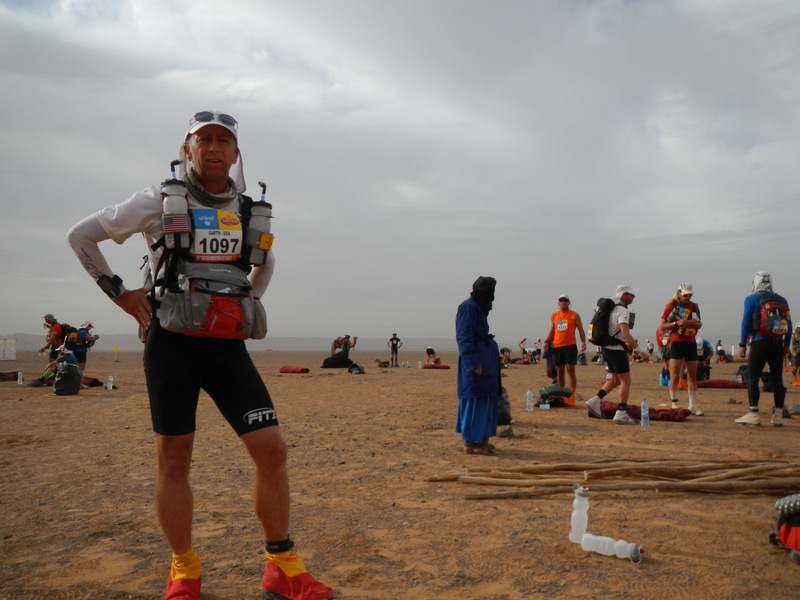 Raidlight pack – New bite valve water bottles on shoulder straps worked well. Pack volume was sufficient. Front pack for food, camera, road book, etc. worked out nice. Also allowed for carrying extra water bottle. Mizuno Cabrakan 3 shoes – Provided excellent protection and support. Too bad they are extinct in the US. Velcro sew job was good too. Many have transitioned to Hoka One One shoes due to cushioning and larger soles. My gaiters – These were, in a word AWESOME! No failures, no sand, no problems! Many with off the shelf models were experiencing holes in the toes during the second stage due to rocks. The material these were made of was no match for the environment. My ripstop nylon held up to the most brutal use. Too bad there is a limited market or I would be in business. I was identifiable on the web cam from a distance because of their unique colors and design. Jocked up and ready to go for the day! 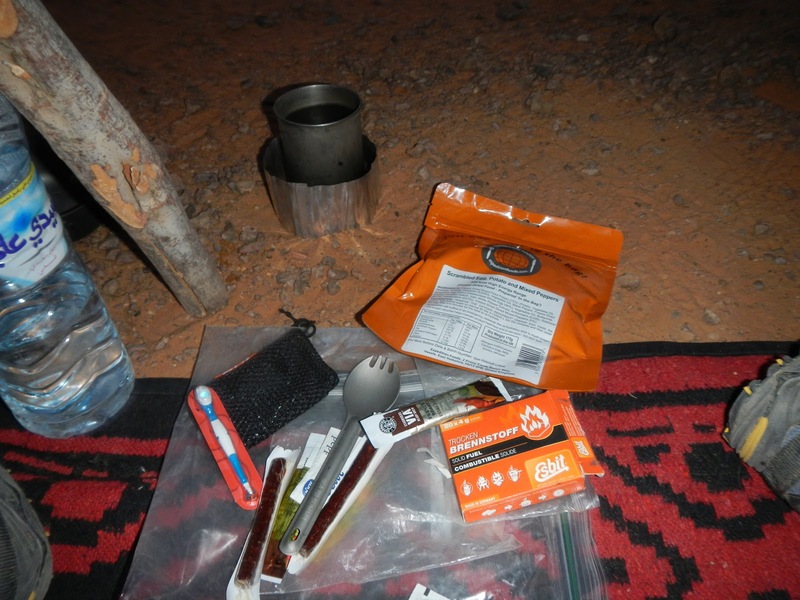 Esbit wing stove, DIY windscreen and MSR Titanium cup (400 ml) – This system was just right in size and at a minimum weight. It was nice to have a hot cup of coffee and a hot breakfast. Many others had kettles and stoves weighing three times as much and taking up four times the space. I was able to get through the event on one box of fuel tablets. Thermorest Neo-air pad – While comfortable and no punctures, I would consider going without a pad or just a small piece in the future. 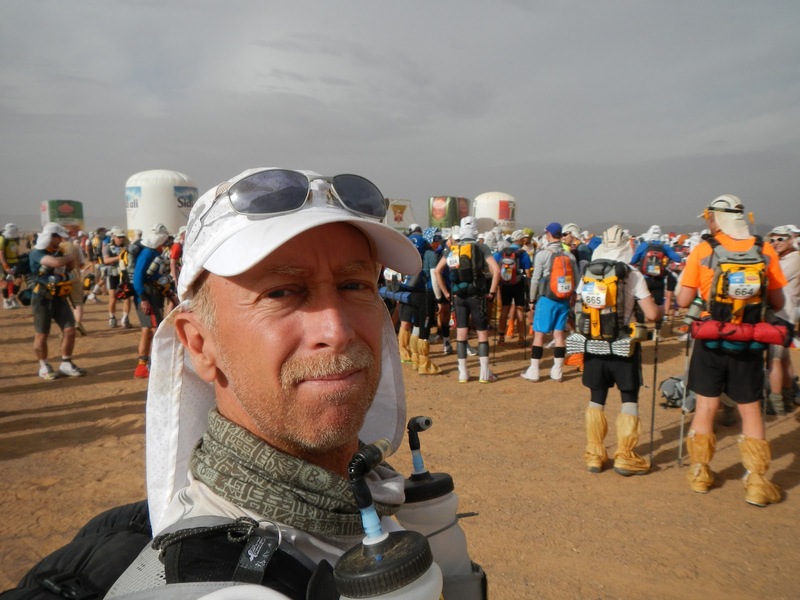 Garmin Forerunner 101 and lithium batteries – This was nice to track my pace and distances to the next CP. Lithium batteries lasted very long. Battery indicator never went below full but I switched them out twice. Saw one other person there with the same model. This prevented me from having to carry a solar charger or go without. If you were into saving weight I would just go with the wrist watch. Buff – This should be compulsory item (almost everyone carries one). I used it for neck cooling/sun protection, eye shades at night, stocking cap, dew rag, etc. All the children along the route and especially at the end covet this multi-functional piece of cloth. Hat with cape – Salomon brand, XA+ model. Nice extra shade on the neck. White of course (along with 900 others). Zoot cooling sleeves, white – I got this on a whim at the last minute and boy was I glad I did. These are a must! While they become quite soiled over the week they do offer a cooling effect and can be doused with water to help out. I saw too many competitors with second degree sunburns on their arms. 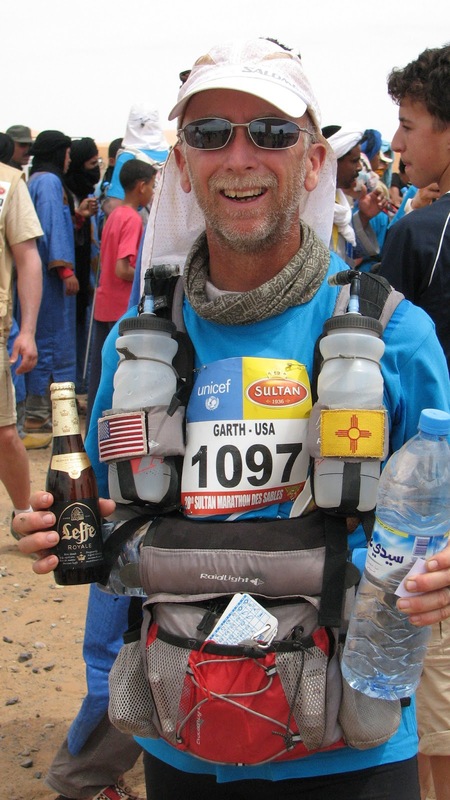 The well equipped MDS’er: Buff, gaiters, hat, Garmin, Zoot sleeves, etc. Slim Jim’s – These little protein sticks kept me going. Mild and regular were both acceptable. Many of my tent mates were envious. I could do a commercial for them and they could sponsor me in the future. Kensio Tex Gold Tape, silk tape, tincture of benzoin and hypodermic needle – Worked quite well for preventative taping and blister draining. Hand Sanitizer – 1 oz was quite enough and worked well for foot cleaning/prep prior to blister surgery (follow up with antibacterial ointment). Zip lock bags – Both zip loc brand for light duty/throw away (food repackaging, road book protection) and Aloksak brand for heavy duty use (passport, first aid, tape kit). You never have enough of these. Leatherman style knife – this was perfect in size and scissors were great for taping. Calorie count/food – 2,900 kcals a day was enough. I could have dropped to around 2,800 kcal/day but that would have been on the edge. I made it out with 400 spare calories (one pro bar). I didn’t appear to lose any weight however my metabolism was out of whack for two weeks after my return – I wanted to eat everything in sight! Food selections were OK. Enjoyed the custard dessert and disliked the Muesli and porridge options. 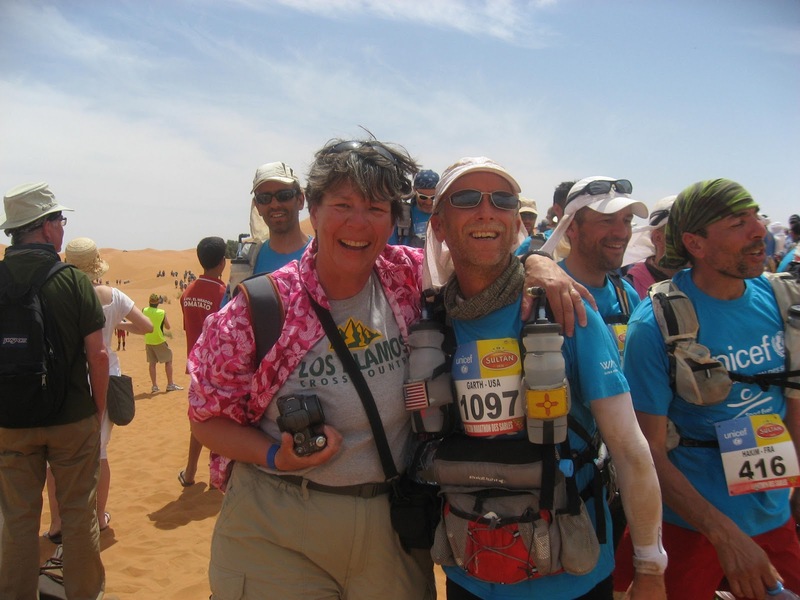 Support from my wife Lisa – What can I say, she was there over the months of preparation and she was there at the end. Even slipped me a beer for the trip back to Ouarzazate! Thanks honey!